In the week that we celebrate Harmony Day, we look at the story of Kofi, who has worked hard to become a life saver. Kofi was excited and proud on his first day as a lifesaver. In order to wear the lifesavers' uniform and take on the responsibility of being on patrol, he had completed training that gave him the skills and confidence for this role. Here is the poster with the Key to listen to Kofi's story. If you have downloaded the Harmony Day stories app onto your iphone or ipad, you can listen to Kofi by scanning the poster. I'm feeling very excited. And nervous. Today is my first time on patrol. Kofi the lifesaver! Since I arrived in Australia four years ago, I have come to the beach whenever I can. I watch the waves as they break, and I think about how my life was breaking until Australia saved me. Accepted me as a refugee. The waves remind me of my family and friends whose lives are still breaking in Sudan. Can you imagine how proud I am? Me – who could not even swim four years ago! In my village, we had to be careful of every drop of water, and I had never seen a beach. There were many times when I felt that learning to swim was too hard. But my teacher would tell me 'When you can swim, you won't need someone else to save you'. He was right. My red and yellow uniform is like a symbol of the changes in my life. It says that I have found a safe place to be, and that I can help others to be safe. What is the main message in this paragraph? What do you think his life was like in Sudan? The image of the waves breaking is symbolic of a very difficult time in his life. Why did he choose this way to talk about his experiences rather than be more specific? Are there other examples of imagery (words that form images) in what he said? The message that 'everyone can become a lifesaver' is particularly relevant to refugees and migrants who have not developed swimming and first aid skills but want to enjoy the outdoor recreation activities available in Australia. The diversity of people who live in Australia makes it an interesting place to live. There are over 21 million people living in Australia who all contribute different ideas, religions, languages and customs to our country. However there are many Australians who do not see people from their cultural background represented in television programs or advertising in the media. Your challenge is to select words and images for a visual text (poster or short video) that recognises the diversity of the Australian community. You want your message to reach a diverse audience. The aim of your advertisement (poster or short video) is to get people to think about learning to swim and joining a life saving club; don't give details of specific courses, venues or requirements. 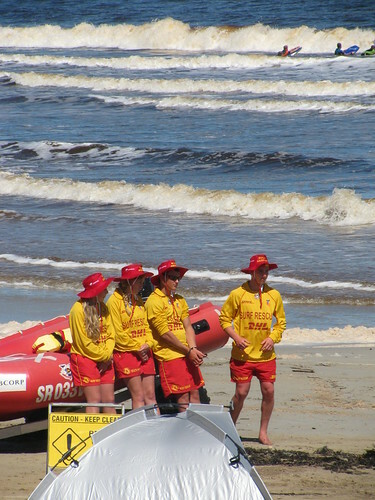 The Beachsafe website has information and videos on all points of water safety. It even has videos in other languages: Chinese, Malay, Japanese, Hindi, Arabic and Korean. Here is a great video of the Top 5 Lifeguard Tips. You can pause the video at each one to read the text. Information about the training that is available from the Royal Life Saving Society of Australia can be found at their website. Here is a link to Royal Life Saving Victoria's multi-cultural project.